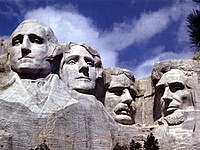 ^ Roosevelt, Theodore An Autobiography, 1913, The MacMillan Company, "On October 27, 1858, I was born at No. 28 East Twentieth Street, New York City..."
^ "TR's Legacy—The Environment".. Retrieved March 6, 2006. ^ Thayer, William Roscoe (1919). Theodore Roosevelt: An Intimate Biography, Chapter I, p. 20. Bartleby.com. ^ Roosevelt, Theodore (1913). Theodore Roosevelt: An Autobiography, Chapter I, p. 13. ^ "The Film & More: Program Transcript Part One". Retrieved March 9, 2006. ^ Morris, Rise of, pg 232. ^ a b Roosevelt, Theodore (1898). The Rough Riders, Chapter III, p. 52. Bartleby.com. ^ Trthegreatnewyorker.com Archived 2011年7月17日, at the Wayback Machine. ^ Matuz, R.: "The Presidents Fact Book", page 402. Black Dog and Leventhal Publishers, Inc., 2001. ^ ALICE IN ASIA: The 1905 Taft Mission to AsiaFreer Gallery of Art and Arthur M. Sackler Gallery Archives, Smithsonian Institution, Washington, D.C. 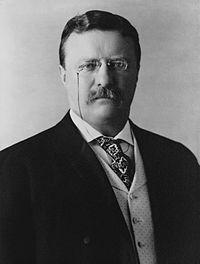 Audio Recording of TR's Progressive Party Acceptance Speech, "Progressive Covenant with the People" with text included. Mellander, Gustavo A.; Nelly Maldonado Mellander (1999). Charles Edward Magoon: The Panama Years. Rio Piedras, Puerto Rico: Editorial Plaza Mayor. ISBN 1-56328-155-4. OCLC 42970390.